It's a lively February, with a pair of big-budget action blockbusters, two sports biopics, some material that's just more topical for Valentine's Day, and a book adaptation that might at last get Jane Austen just right. 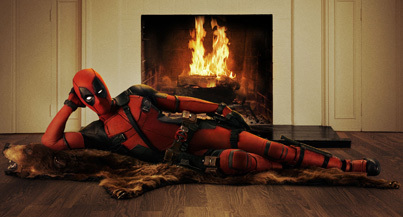 The first of many, many, many superhero films set to launch at the screen in 2016 is this Ryan Reynolds vehicle, a Marvel Comics adaptation from Fox, about the foul-mouthed, anti-heroic assassin and mercenary who's not exactly a traditional leading man, as the advertising often reminds us. It's also the film pre-anointed by the powers that be as the month's biggest, and that's not hard to believe: after Kingsman cleaned up on the 13th of February last year, it's clear that R-rated comedic action bloodletting plays unsurprisingly well over the Valentine's Day weekend (everyone's just in the mood for it). Early tracking, which I generally ignore and never ever mention out of general principle, has Deadpool polling at an above $50 million opening, which seems high but is probably no longer implausible. Reynolds has headlined some really big movies like The Proposal and Safe House, and starred in a few smaller ones (last year's Woman in Gold was underrated); here he sports a mask for much of the film's length, all the better to hide his character's face, which has been mangled beyond recognition in some kind of unfortunate and unavoidable chemical treatment. Reynolds debuted the role back in X-Men Origins: Wolverine (2009), one of the least beloved of the X-Men pictures, but any qualms about that film seem to have generally disappeared from the public's memory in anticipation for this one. And there are memorable supporting actors along for the ride, including the intimidating Gina Carano, the fetching Morena Baccarin, and perennial comic relief figure T. J. Miller, who spends much too much time in the trailer commenting on Deadpool's deformed, mangled, grotesque, repulsive, face. Deadpool won't, or can't, or maybe it can, open quite as high as Fifty Shades did on the same slot last year, but it should still easily win the month.